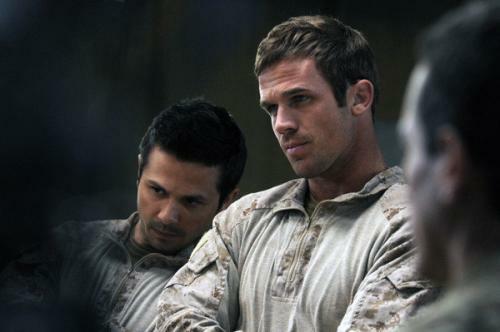 In SEAL Team Six, Cam Gigandet (Pandorum), Anson Mount (Burning Palms), Freddy Rodriguez (TV’s Six Feet Under) and Xzibit (Bad Lieutenant: Port of Call New Orleans) are among the SEALs called to a secret and important mission. Kathleen Robertson (TV’s Boss) plays Vivian, the agent who has been tracking Osama Bin Laden and believes she has identified the compound where the Al Quaida leader has been hiding. Robert Knepper (TV’s SGU: Stargate Universe) is the Lieutenant Commander of the team, and Eddie Kaye Thomas (American Reunion) is one of the executives in the White House while the mission is going on. The 90-minute, not rated film got mixed reviews from critics. Newsday‘s Verne Gay called it “not great, not terrible.” Hollywood Reporter‘s Tim Goodman said the movie “feels like a documentary at times, a cheesy docudrama at others.” Agreed on all counts by us at Disc Dish. Special features on the DVD include a making-of featurette.